On August 11, Rhino will release ANTHOLOGY 2: GROUPS AND COLLABORATIONS as a physical three-CD set designed by Roger Dean and digital equivalent. The collection spans more than 50 years of Howe’s prolific career with 56 tracks that mix hits with a generous selection of unreleased recordings, including several with Keith West, who was Howe’s bandmate in Tomorrow and The In Crowd. This looks like a great collection of songs from the past 50+ years. Really looking forward to this release! This will be an extremely diverse and comprehensive Steve Howe compilation. 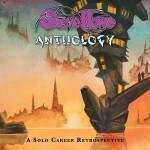 All Steve Howe Cd’s are invariably captivating, virtuosic and musically refined and exquisite. Really looking forward to hearing the GTR2 tracks for the first time!